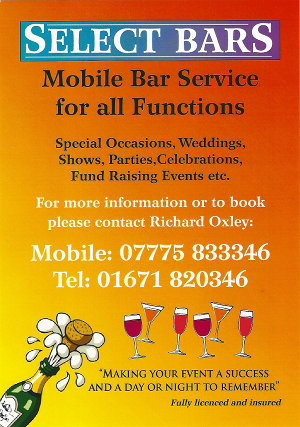 Established in 2012 Select Bars is a new professional mobile bar service based in Dumfries and Galloway. We provide a service that caters for all functions; weddings, birthday parties, fund raising events or any other celebrations. Our professional, friendly and capable staff will help to make your special occasion a day or night to remember. A discrete and efficient table service can be provided. There is no event too small or large for us to cater for. The professional service we provide is able to make provision for large events and Agricultural Show bars. Select Bars is fully licenced and insured. It offers free set up, with zero booking fee. Ensuring there will be no added cost of a bar at your function. Select Bars was established due to a recognised requirement in the area and as farming diversification project.